I have entered The Czech Republic and hills have greeted me with a welcoming heart. The Passport Control was non existent and as I crossed over the border i was greeted with so much glass i think its an international custom to throw your bottle out of your window as a celebration of leaving or entering a country, fair enough unless your trying to cycle through. so im going to get a puncture any minute now, but no nothing, the gods are smiling at me. I look at my tyres for glass front one good back one oh dear no glass problem but what i can see is the webbing in the tyre tred all gone, when did that happen!. Time for a new tyre that one has lasted from stockholm to here. ok bike shop here we come. I come of the main rd and head to a local town and within 10 miles manage to get a new tyre. for the equivellent of 5 pounds. things are still cheap here. New tyre on and off i go, its great comming into a new country very exciting you just have no idea whats going to develop before you. So later in the day im sitting on a bench in alittle town eating lunch watching the world go by and looking at my map, when this couple come and sit next to me. The usual start Oh you english then my story,they listen with intrest and can speak english well. next thing he takes my hand and grips it tight and with his other hand on my head he repeats over and over jesu, jesu, jesu, i just go with it for a while, then they start to chant i dont know what but its ok, then water is on my head, then he lets go, stands up and leaves with this women. Thats it, what was that have i just been saved! I feel the same. 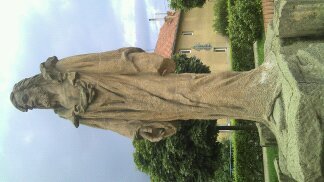 I finish my lunch pack up and cycle on, to the next town and find this statue. welcome to the czech republic.